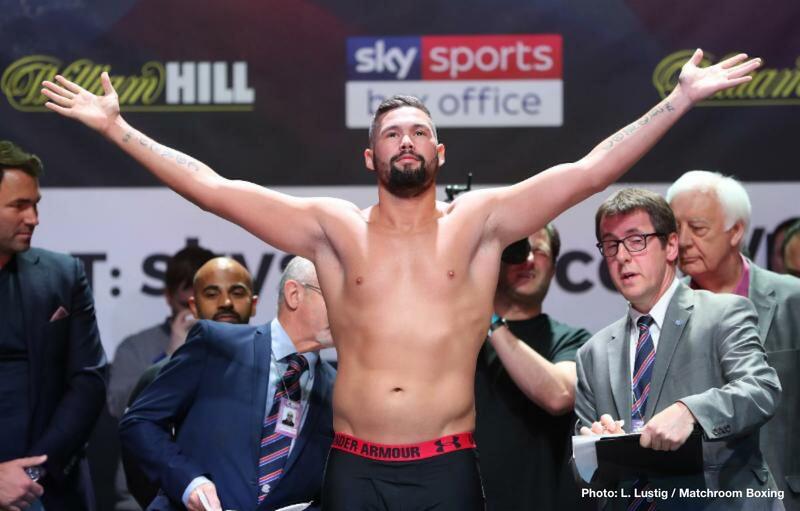 Tony Bellew has made up his mind: he aims to go out in a blaze of glory in a fight that he fully acknowledges will be the toughest of his entire career (barring the light-heavyweight loss he suffered to Adonis Stevenson, back when, in the words of his promoter Eddie Hearn, Bellew was “like a skeleton”). Speaking with talkSPORT, Bellew said that Hearn has “made calls” regarding making a fight between he and newly crowned undisputed, four-belt cruiserweight king Oleksandr Usyk, and that if it is up to him, the fight happens next. Bellew was somewhat flattered that Usyk, after beating Murat Gassiev on Saturday night, called him out. Bellew, who has made a habit of upsetting the odds – three times and counting: versus Illunga Makabu and against David Haye X2 – knows a fight with the gifted Ukrainian would be a punishing, possibly damaging affair. So, can “Bomber” do what 15 other pro opponents have failed to do, and beat Usyk? Has Usyk even been troubled in a pro fight this far in his quite amazing career? One thing that can also be asked is this: if Bellew does pull it off and upsets Usyk, is he in with a real shot at going into The Hall of Fame one day?